A beautifully illustrated Christmas story from a favorite author/illustrator. This is Reuel's big chance to prove that he can tend sheep just as well as his older brothers. All he has to do is keep a watchful eye on his little flock. But distracted by his brothers' teasing, he looks away just long enough for a young lamb to wander. Following a frantic search, Reuel finds his missing charge -- and finds himself in the midst of the biggest announcement ever made. The Christ Child has been born, and Reuel is one of the first chosen to hear the news! After racing through the streets of Bethlehem, his misstep becomes a blessing when he encounters the Baby who will one day become the Shepherd of Men. 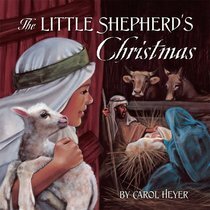 This tale of the first Christmas, told from the viewpoint of a little boy to whom young readers will relate, is illustrated with gorgeous, detailed paintings by Carol Heyer. Her art showcases the sweetness of the child shepherd and the reverence of the story. Here is a book that both entertains and informs without ever straying from the meaning of the holiday. About "The Little Shepherd's Christmas"